I-GOs Posted on Fri, 07/07/2017 - 11:14. 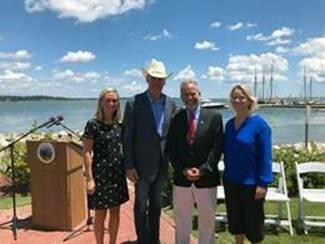 YORKTOWN, Va., July 7, 2017 – In a ceremony held today in Yorktown, Virginia, U.S. Secretary of the Interior Ryan Zinke shared a $14.7 million check with Boat Owners Association of The United States (BoatUS) Vice President Heather Lougheed, who accepted on behalf of America’s recreational boaters. The amount represents 2017-18 funding for the federal Boating Infrastructure Grant (B.I.G.) program, which funnels user taxes paid by boaters to develop transient boating projects. The Secretary and BoatUS also urged municipal marinas, private marinas and boat and yacht clubs to consider applying for available funds by the Sept. 11, 2017 deadline. BoatUS was instrumental in creating the program in 1998 that is viewed today by local municipalities as an economic-development tool to attract overnight-boater spending. The B.I.G. program recognizes that transient boaters offer economic benefits and add to the vitality of waterfront communities, marinas and boat clubs. Funds go to construct, renovate or maintain transient-boater facilities, including docks, moorings, restrooms (including floating ones), fuel docks, electricity, water and sewage utilities, recycling and pumpout stations, and potentially small dredging projects.